ProFence LLC is a leading fence provider and installation company serving the Eastern USA. We specialize in fencing for many different types of animals. We know which type of fences that need to be used to keep animals in or out of your property. Woven wire fencing for alpacas is a great match as woven wire fences are very strong. Alpacas will sometimes rub against fencing so strength is very important. Woven wire fences are tall enough that alpacas will not be able to jump over it. Predators large and small cannot get through this fence due to the tight grid of woven wires. 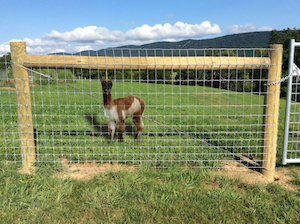 Installing a woven wire fence for alpacas is one of our specialties. We have installed woven wire alpaca fences for properties large and small over all sorts of terrain. We have been providing professional fence installation services since 1993. We will get the fence installation done on time, within budget, and right the first time. Fill out our woven wire Alpaca Fencing Quote to get started.